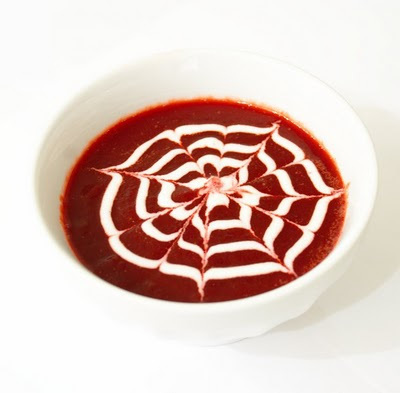 Beet soup is messy but easy to make. First you boil the beets and the carrots in chicken stock with ginger for about 1 hour. Then you blend them until the liquid is smooth. A food processor is the best way but a hand blender is just as good. We served it with a dollop of plain yogurt. This soup is very delicious and hearty. Beets are low in calories which makes this a very healthy choice. 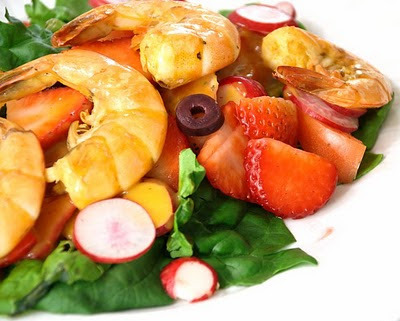 To make salad more interesting we used spinach, strawberries, radish and black olives. We added sautéed shrimp that were cooked in orange juice and red curry. Shrimp cooked with the shell on has a more intense flavour than peeled shrimp. This salad was improvised using what we had in the fridge. Like we have said before, we never make the same salad twice.